At the end of the first stage I’m breathless and excited, with my heart beating fast. The Safety Officer tells me to unload and show him a safe gun. I’ve done this before but I can barely understand him. Eighteen shots ago, a timer went off. My hands reached for my gun and my brain stopped. Now the Safety Officer is reminding me that I was supposed to shoot targets in a certain order and with a prescribed number of shots on each target. Yeah. I dimly remember hearing that during the briefing. I even watched other people do that as they shot the stage. It is coming back to me as I catch my breath. Simple things like which target to shoot and which target not to shoot are hard decisions when you’re excited. At the end of another stage I notice that there are sights on my handgun. I’m probably supposed to use them for something rather than simply pointing the gun at the cardboard bad guy and mashing the trigger. Things are getting better, and at least I’m waiting until the gun has recovered from recoil to shoot the next shot in the general direction of a cardboard target. At least I notice the gun in front of me, even if the sights are a distraction. I remember my instructors saying I was supposed to look at the front sight. I know I heard that somewhere in my training, maybe more than once. I’m amazed how much of my training slips away when I have to do simple things at the same time. I’m not going to try to chew gum and shoot at the same time. That bit of multi-tasking is for experts. I have two hands. 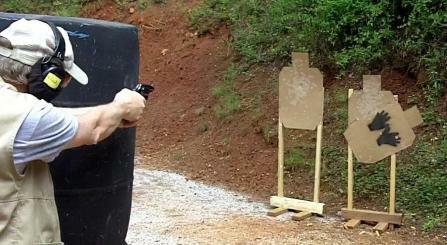 It is hard for me to move very fast if I keep both hands locked in a death grip on my pistol. I’m supposed to (1) keep my firearm pointed in a safe direction, (2) with my finger off the trigger, and (3) move my feet without falling down… all at the same time!??! Snicker. Right. Sounds easy, except I could pass out when I forget to breath. There is a very natural reason to keep both hands locked on the gun. 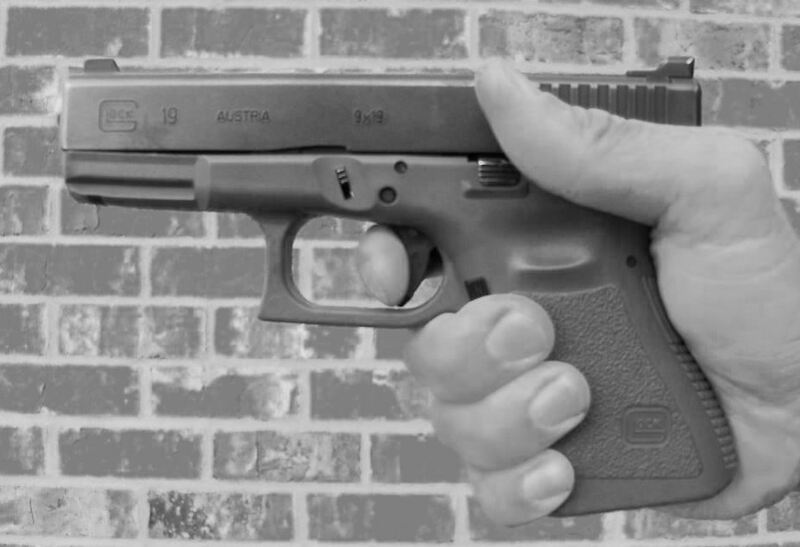 It is really important not to point your loaded gun at precious body parts, like your support hand! Sometimes these gun games make me use my support hand to open doors, grab props, or reload the gun. Evil people thought up these two-handed tricks to cloud my mind. Eventually things get better. One stage has us moving from point to point and shooting. I could move slowly and have a stable shooting platform as I move. I could race from point to point and save time, but how fast should I really go? Rather than play gun games, I decided to move as if someone was shooting at me and I needed to keep my eyes on him. That must be the essential point of the exercise, after all. In real life, why would I have a gun out and be shooting unless people were already threatening me and those I love? We can play gun games on the weekend, or we can practice the way we might have to fight. I suspect I’ll be scared and confused, so that is the way I practice… even as I scramble from place to place on the range. The second thing I was taught about shooting was to trap the trigger after each shot. I’m supposed to do that so I can shoot more than once and keep the gun under control and well aimed. (Yeah, there is that issue of using the gun sights again.) Sights and trigger probably have something to do with shooting well. About now in the match I’m remembering to trap the trigger between shots. Hey, that helps a lot! They should probably teach that to every student. Well, duh! For me, the point of gun games is to overcome the brain freeze that will happen if I ever have to use a gun for self-defense. I’ve never been shot at, but the stories about being mentally unprepared seem realistic. They talk about having to fall back on your training when you can’t think. I’m almost an untrained idiot when I start each match. It takes me most of a match to remember what I should do. 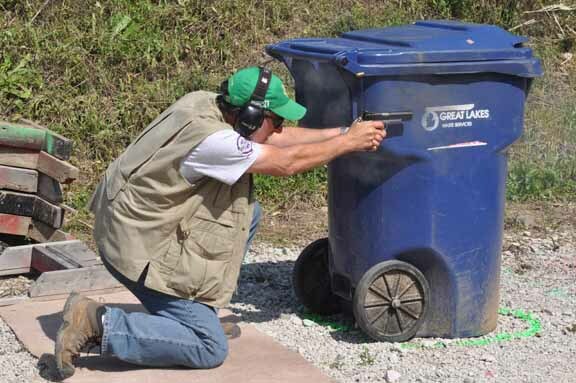 There is a lot you can learn from even the simplest shooting sports. Give it a try. You might like it. My friend had fun laughing at his mistakes and at mine. Anyone can have a great time if they will laugh at their own mistakes. Thank you for leaving me a comment, Doug.